Moravian – The Humanities Now! Our final project is to design a website together as a group, instead of doing our individual projects. Since different pages in this website talk about different digital tools we learned during this semester, our first mission is to identify each person’s role in this project. 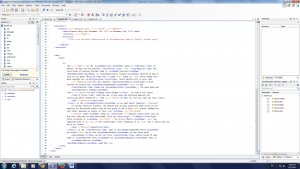 With the help of Spiderscribe, we separate the project into five different parts. 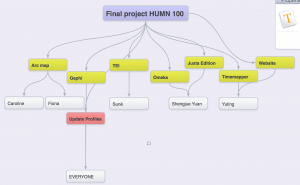 Yuting is responsible for the website design and Timemapper. In her page, she talks about the historical background of the journal we are working on, which helps reader have a broader vision of what was happening at the same time in the 1740s. Sonia is responsible for both the Juxta Edition and Omeka. Since the two digital tools are what we learned in the beginning of this semester. 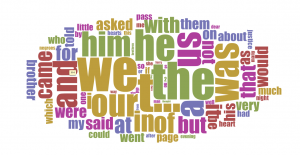 Her work is mainly to check the spelling of the translation and the tags of people, place and time. 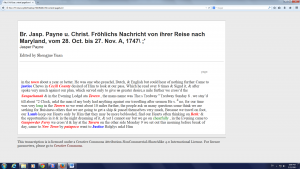 As what she wrote on her page, Omeka is a tool to make original manuscripts more accessible for the public and Juxta Edition is amazing because it makes reading more easily. Suné’s job is to working with TEI files in Oxygen. She did really a good job in double checking the mistakes in the codes, changing the size and color of the content, highlight the places and characters’ names. Caroline and I are responsible for making new story maps which are based on the old story maps we created individually before. 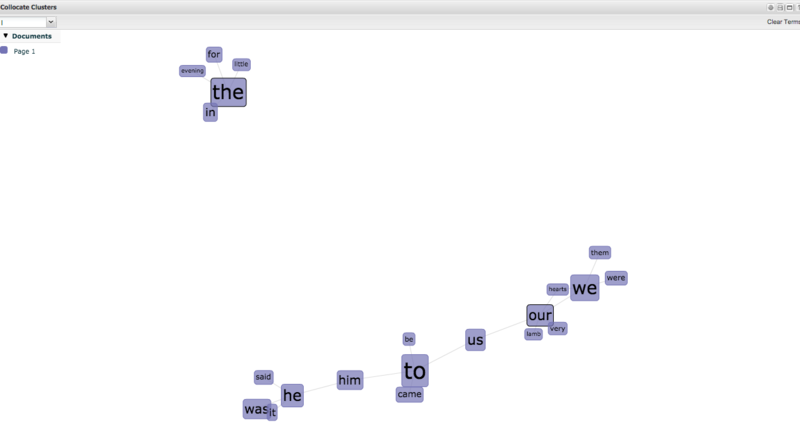 I also accepted the job to work with Gephi, which explores relationships between people who appear in the journal. Since the final project is more like a connection, not a creation. We reread the blog posts we wrote before and the materials which were posted on the word press. Interestingly, The process of doing our final project reminded me a lot of what we did during the whole semester. 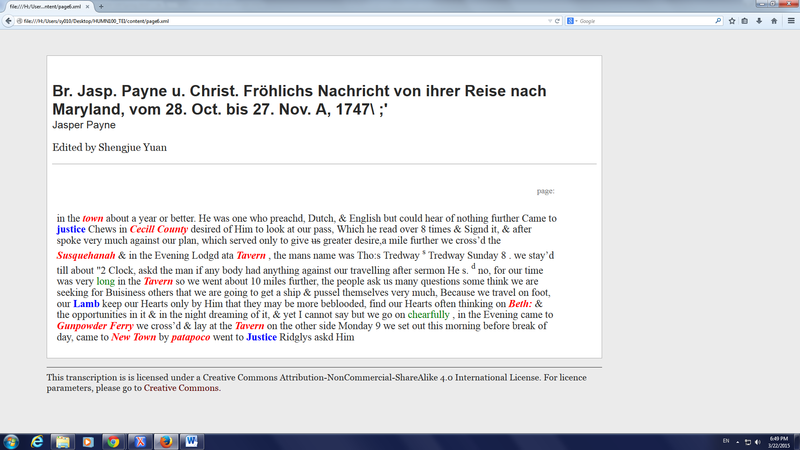 During this whole semester, we’ve been working on the Payne and Froehlich’s Travel Journal. Since it is my first time to get access to 18th century handwriting manuscripts, the translation of cursive writing of the letter was a big challenge for me to overcome. Thanks to Professors’ help, I gradually found out the similarities between the same letters and the speed of my translating increased a lot. 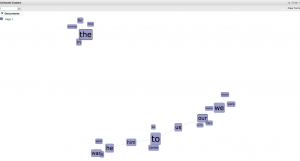 During the future several weeks, we learned how to use Juxta edition to tag people and places, and TEI files to do some deeper and more precise reading, which is called close reading. 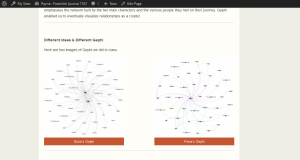 Gephi and Time Mapper are two more digital tools to analyze the journal in different aspects. 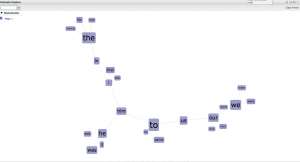 Gephi puts emphasis on relationships between people, and otherwise, time mapper puts all event in the order of time. However, my favorite digital tool is GIS and I finally chose it as my part of final project. The process of creating my own story map is full of fun. Although everyone’s story is based on the same journal, everyone focused on different parts. As the final project, I mixed mine, Sonia’s and Sune’s story map together. When I was browsing their map stories, I even got a deeper understanding of what Bodenhammer said “deep maps…..are genuinely multimedia and multilayered”. With different compositions of different maps, our map stories have totally different topics and focus on the new relationship between elements, like slaves, plantation and Moravian. 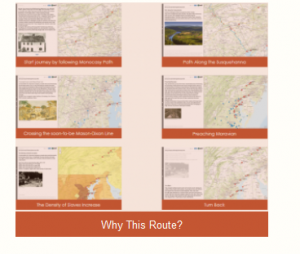 My own map story talks about how they finally chose the route. 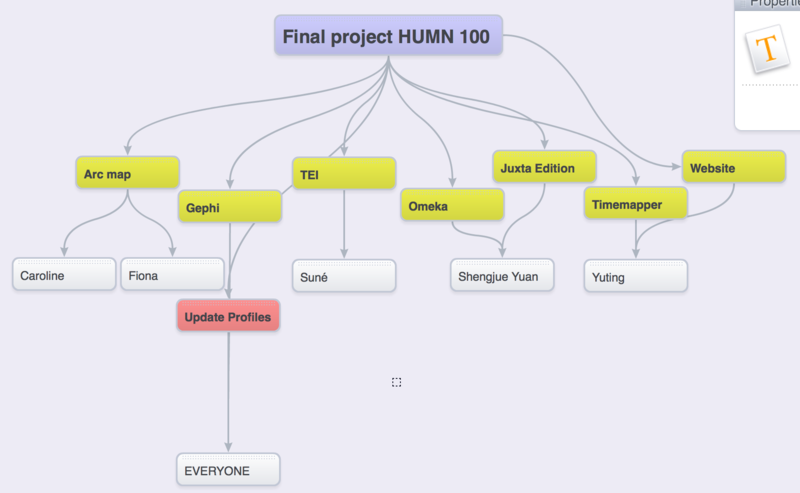 However, after I mixed mine with other people’s story map, the whole story became more abundant. It is because the historical background, the locations of plantations, the real life of slaves made the story more trusty and logical. In this case, we can concluded that: They started from Bethlehem in Monocracy Path. They changed direction when they arrived Lancaster. It’s because along the Susquehanna River live many Native Americans and there are also many colonial ferries. After they crossed the Susquehanna River and got into Maryland, wherever they stopped and lay at is never far from plantations. They started their journey from those concentrated areas of itinerancy and preaching in Pennsylvania and tried to bring Moravian culture to occasional areas of itinerancy and preaching in Maryland and Virginia. I also worked on the page of the introduction of Gephi. Since there is no blog post about Gephi and it had been a month since we discussed about it, it was a big challenge for me in the beginning. Luckily, Professor Faull sent me the images of our Gephis, which did a great help in my page design. After consideration, I finally chose Suné’s and my Gephis as a contrasting example in the page. 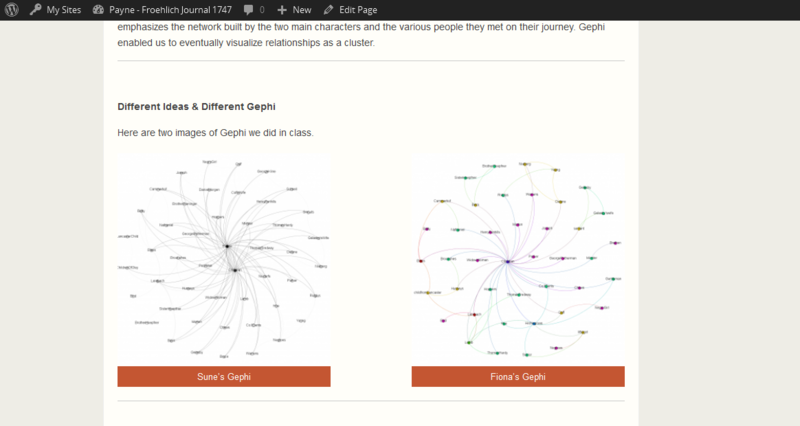 As we all know, since the visualization of Gephi largely depends on the nodes and edges we add, different thinking of relationships between characters leads to totally different Gephi. Suné and I have two contrast thinking of the design of Gephi. With two main characters, Froehlich and Payne, in the center, her Gephi is a network visualization of the relationship between each of them and all people who showed up on the journey. Comparatively, my Gephi looks a little bit simpler since it has only 1 center character, Froehlich. My idea is that, as Payne is the writer of the whole journal, he definitely has an central relationship with every other person who appeared in this journal. Because of this, I took him out of my Gephi visualization. At the top of this page, I cited what Mathieu Bastian & Sebastien Heymann said about Gephi. 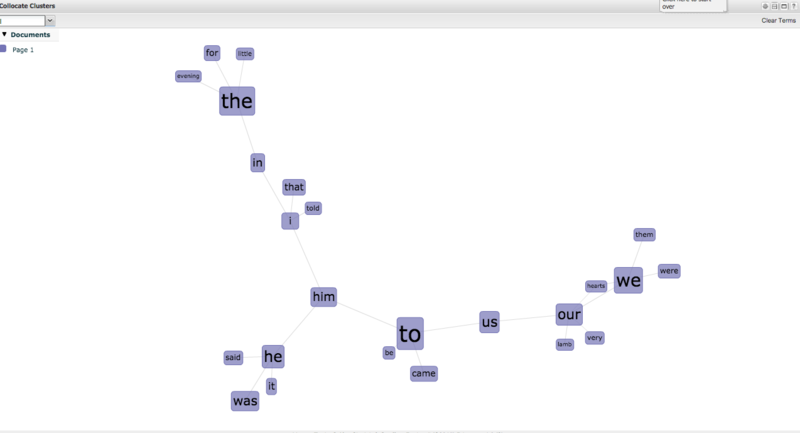 It is because i think it will give reader a clear view of what Gephi’s function is. This final project is meaningful to me, not only because it provided me with a chance to review what we learned during this whole semester, but also because it made me fully understand the importance of cooperation in a team. Since Yuting is the one who designed the whole website, to upload my pages before deadline is significantly important. Here is the link to our amazing website. Recently, we learned how to use different kinds of digital humanities methods to transcribe and study diaries produced hundreds of years ago. By doing distant reading, we had a rough understanding of author’s purpose and destination. In order to have a better and more precise understanding of the diary, we did close reading by tagging words with Juxta edition and Oxygen. Close reading helps us learn more details, such as the route, the people they met and the events on their way to their destination. We even learned about the relationship between places and people, places and time and events and places. Compared to Juxta edition, by which we could only roughly tag people, place and time, Oxygen enabled us to tag more, such as emotions and objects. It even had a more detailed classification, for example, it separate tag “name” into two parts—“persName” and “roleName”. It also distinguishes “time” from date, which would be more convenient when readers want to find specific date from tremendous database. When I was tagging the words in Oxygen, I was confused since there are too much information to decide which word to tag and which word not to. This recalled me of Elena Pierazzo’s idea of diplomatic edition—there are infinite facts in the work we are going to edit so that we need to have a selection among these facts. The selection should, as Elena said, “aspires to equal the object to be studied.” But, “be simpler than the object it models”. Therefore, I prefer to tag information about where, when, who, what, what happen how it looks like and how people feel about it. I did lose something from the original pages during the transcription procedure. 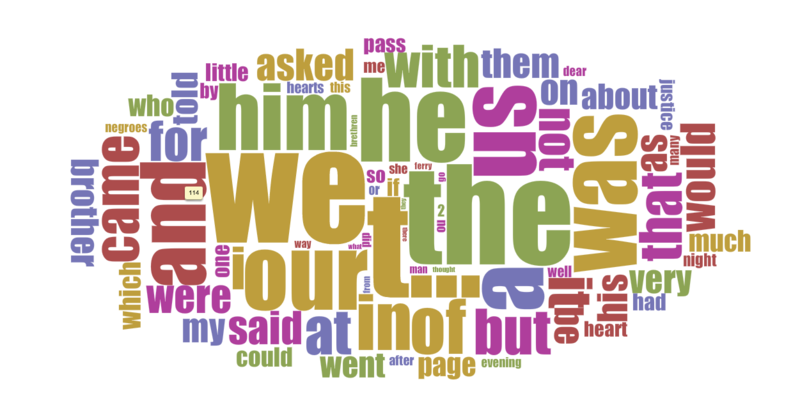 But as Elena said that transcription was “not a mechanically complete record of what is on the page.” –making tags to emphasize some parts from the diary and correcting the misspelling the author made from the original pages. 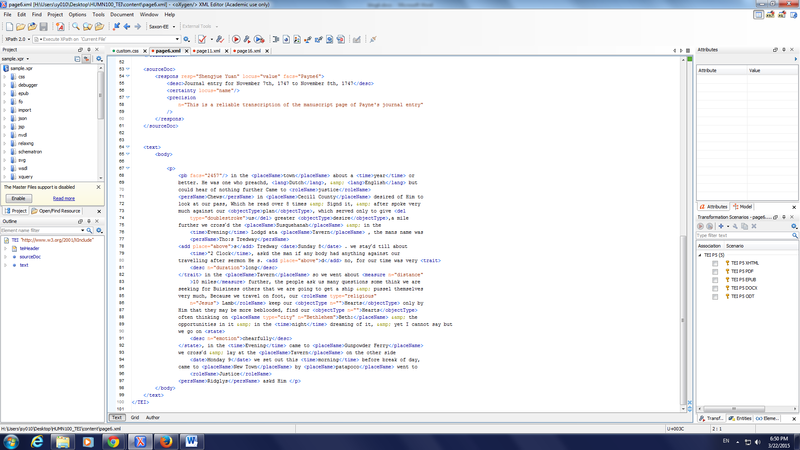 What I did in my transcription procedure made information from the diary clearer and easier to read. When I was designing the web, I did not change the color of background and most words, since it fit to most people’s reading habit. But I chose to made “placeName” bold, italic and red, and “persName” bold and blue. Different colors made them eye-appeal and I think place and people are two main parts in the diary. I also change the color of “characteristic” into green so that we can easily figure out people’s feeling about the events or the objects.